DC Collectibles has given us a sneak peek at the action figures and statues to be showcased at San Diego Comic-Con in a couple of weeks, and one of them is a figure of Barry Allen from the upcoming Flash TV series. So far it looks nicely poseable and is a great likeness of actor Grant Gustin in the Flash suit, which bodes well. There are no other details as of yet, but you can see the rest of the imminent figures at DC’s blog, and some of them look really nice. Presumably we’ll learn more about the figures once SDCC is underway. And if you’ll be attending SDCC, the blog post has information about when and where the collectibles panels will be held. What do you think of the figure so far? Is anyone hoping for more figures based on the TV series? 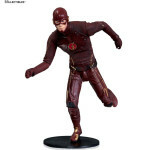 This entry was posted in Collectibles and tagged Action Figures, Flash TV Show 2014, Toys on July 11, 2014 by Lia. They need to fix that Flash suit. Give him the right logo and ear pieces, get rid of that stupid belt and give him the waist/forearm lightning trim. Make the lightning bolt in the symbol even. Ear pieces need to look how Ethan Van Sciver draws them. Looks better here than it does in live action at least. …or you could just appreciate the fact there is a The Flash TV series at all and that they came up with something a little more real-world friendly ?